AS THE year progresses and we move towards the end of September many things change. For me, over the years Lake Awoonga has been an amazing place. 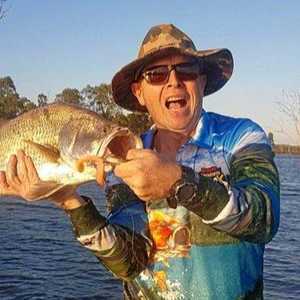 From nearly casting my arm off trying to catch a fish – while a 15-year-old teen catches them one after another beside me – to watching and another big unit called Dave Hodge casually flicking lures in such a way that they look yummy to barra. I have seen it when the dam rolls with warmer water that has been pushed from the bottom up against one side of the lake by a strong wind. I’ve also seen it where the water temp has been that low that a few fish haven’t survived. I’ve seen the fishing so good that when the rising moon peeks over the Castletower National Park, you could throw a spoon at them and they’d go after it. Last weekend was one of those weekends, where the Big Willy manufacturer Trevor Burgess and his wee mate Earl “I’m a gun photographer” Haigh, ventured up to the impoundment and had a session to remember on the Happy Rock Softies. They have some displayed on Facebook and here is one of the many they caught, most in the 600-700mm range. September is the time when the water starts to warm up and the fish become a little more active. Coupled with the full moon rising, the late afternoon setting sun and the water a tad warmer – conditions were just right. Keep in mind also that there are still six fish (I think) in the lake with pink tags in them, each worth $1000. These 600-700mm fish will be around the metre this time next year so brace yourself! Out in the saltwater the conditions were good prior to Sunday. A few got out to wet a line but since yesterday things are on the improve. This will be short lived till lunchtime Sunday when the SSE breeze strengthens to around 15 knots by mid-afternoon. Those heading out tonight and planning to be home Sunday should really enjoy the conditions and fishing as we lead into the last quarter. Those venturing out of Seventeen will have a huge selection of places to go; from the Wides through to Fitzroy, Boult and Lady Musgrave and not forgetting that wall at Lamont. The ones slipping out from Boyne (and yes you still need to be aware of the bottom when using the channel around low tide, as many props have been smashed from some not using their seamanship skills), the options are huge with 10 mile, Eugene’s Pots, Tullarook, Rock Cod, and Leachies all holding excellent fish and so close to shore. Venturing further afield the pressure points on Masthead and Northwest like fishtail are going to be the spots to target. If you are heading out from Gladstone, Rundle and Cape Capricorn especially, the ground out wide will be holding excellent stocks of nannygai and other reds. Further out, around the Fitzroy gutter, and out through to Douglas Shoals, the fern country in there will be sitting upright at slack water and will be easily seen on the sounder. Mark it on the plotter and target big reds. Make sure you all log onto VMR Gladstone or Roundhill on 82 depending on where you depart from. They need to know where you are. If you aren’t a member then give them a call and become one as it does pay to belong; I should know.